4th year Pic 214 - Sep - 18 2012. 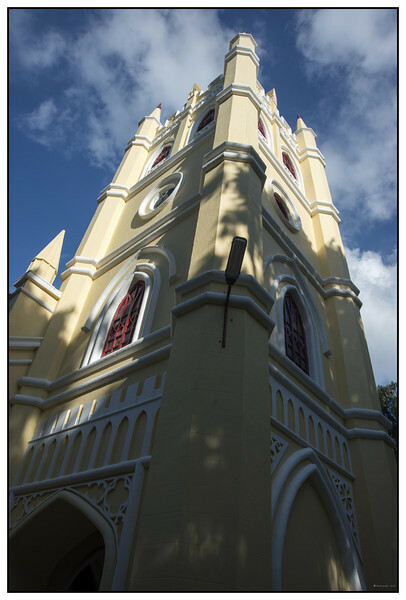 All Saints Church - Coonoor All Saints Church is a part of Church of South India and established in 1854. It was right next to our hotel in Coonoor. http://allsaintschurchonline.com/ Critiques welcome! The lightig is soft and wonderful for this beautiful church. Beautiful building and great perspective and capture of light. Reaching into the sun...Wonders of modern medicine...Monday a week ago I was in the hospital to have two stents placed in my heart...tomorrow I leave to shoot a convention in Atlanta for three days. What a lovely church Harsh. Nice point of view, and wonderful light & shadows. Well done.